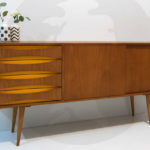 Back in May we featured the wonderful Randall sideboard, which proved to be very popular. 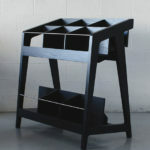 Fast forward a few months and it now has a little brother or sister, the Randall small sideboard at Swoon Editions. A similar midcentury look, but for smaller spaces. Gone are the drawers, but the cupboards live on with a two tone finish. The angled legs are also still here of course. The unit is made of mango wood with a grey wash finish and it limited to a run of 17. 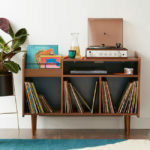 If you want one for your midcentury-inspired living room, the Randall sideboard retails for £329.